The paradigm of Anthropogenic Climate Change Alarm (ACCA) depends specifically, and singularly, on a mechanism called the “radiative greenhouse effect”. This is the attitude and approach taken by climate alarmists and the entire field of climate science to its postulate of a radiative greenhouse effect. But in fact, the (radiative) greenhouse effect of climate science is not how an actual greenhouse functions, and, their new definition of the phrase “greenhouse effect” contradicts the traditional meaning of the term greenhouse effect as it exists in an actual greenhouse. The thing is, a real greenhouse should function by the new mechanism of the radiative greenhouse effect of climate science, but, it doesn’t. And if the mechanism doesn’t exist in a real greenhouse, where it should exist, then it can’t exist in the atmosphere either since the laws of physics are universal. There is something wrong with the following diagram and its blurb. Can you spot it? The answer is in the paper. –Hockney, Mike (2015-06-02). The War of the Ghosts and Machines (The God Series Book 28) (Kindle Locations 655-656). Hyperreality Books. Kindle Edition. Do you want to take down scientific materialism, the scientific anti-philosophical paradigm? Do you want philosophy to use mathematics and physics better than science can, and to make philosophy once more reign supreme in intellectualism and to assert its supremacy over science? Perhaps something more current, more part of the social zeitgeist, will help. Unless you have an event more interesting. By the by, anyone who’s educated enough and has enough intellectual merit can publish articles on the “History and Philosophy of Science” section of arXiv, hosted at Cornell University Library. It would be nice to see it populated with a certain ontological class of philosophy papers analyzing the myriad paradoxes and inconsistencies of modern science. As it turns out, my own thermodynamics partial differential equations professor outlined the same fundamental error of climate science and its greenhouse effect over 10 years ago, and wrote about it in his book! It’s no wonder he discovered the problem too, given that he taught me the Fourier mathematics I myself used to confirm that there is indeed a fundamental, irreducible, fatal error at the very basis of climate alarm, thereby rendering climate alarm totally wrong from the very ground up! Great stuff! “Don’t you think the situation is a little insane? That the fundamentals can be totally, and even obviously and very simply wrong, yet they continue on and ignore such fundamental criticism? Doesn’t this say something about the health of science, or about a fundamental problem with it? It’s bizarro land. They say it is about social justice…but how is wanting to make the weather more equal about social justice?! Gallery | This entry was posted in Fraud of the Greenhouse Effect and tagged Finagle, Joseph Fourier. Bookmark the permalink. What’s wrong with the diagram & blurb? How about everything. The principal error is double counting, what is emitted from the surface IS what’s emitted from the atmosphere to space – is the same ‘lot’ of energy. The atmosphere cannot magic up another 239.7 whatevers out of thin air! Don’t you think the situation is a little insane? That the fundamentals can be totally, and even obviously and very simply wrong, yet they continue on and ignore such fundamental criticism? Doesn’t this say something about the health of science, or about a fundamental problem with it? It’s bizarro land. There is a real problem at work here. I have been at this for more than 30 years. I got to madness as a conclusion long ago. But now I have accepted that humans are inherently limited. On technical subjects they may be able to be much smarter than they are in practice, but they are so very distracted that they cannot think about even simple things despite their potential. This is the only subject I know of where the subject matter is out of bounds to any debate about the topic. On things like this people behave like drunks whose ignorance is above .08 but there is no social pressure to make them refrain from driving. To the contrary they insist on driving. It would not be so bad if they would just sit things out, but here we are listening to all manner of benighted fools in positions of power or authority pontificating about what they know nothing about, from journalists to academics and politicians, while simultaneously working to silence anyone who tries to push the actual subject matter into the discussion. Oh man … AWESOME paper Joseph!!! … I am so glad you are doing more writing on this subject! Keep up that GREAT work Joseph! … Super! Thanks Joe, you are a TRUE MEGA STAR!!! When will the so-called skeptics realise that they have been barking up the wrong tree? It is nice to document how easy it is to see the problem and have that documentation published on the net for the generations to come. Someday, mother nature will prove beyond any doubt that CO2 is not warming the planet — and when that happens many are going to claim that there was no way to know that. But there was. There is. Just now got a chance to read the linked pdf of the paper. Absolutely great. Actually yes, thanks Quokka the one comment about adding the energies the other way was helpful. Shouldn’t have snipped that part but oh well. Of course it doesn’t change the findings or conclusion of the paper. The paper has been updated on arXiv too…or will be once the update gets through their system. Thanks for the help. Always nice when a review correction still makes the same point! The point to understand here is that at no point can the power being expressed inside the device exceed that of the input power source to the device itself. Only the insulative scenario is true, valid, reality. Excellent. The “greenhouse effect” proponents cannot even get their story straight. Mostly they claim back radiation equals incoming solar radiation (e.g. 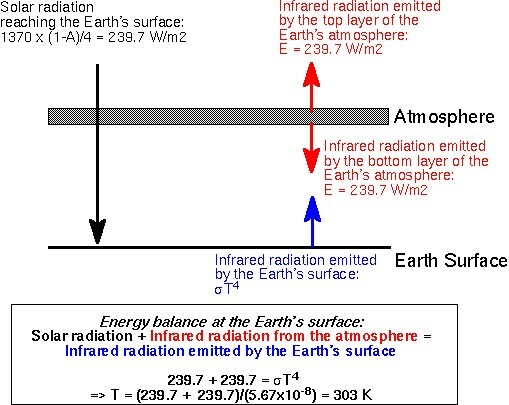 the Boston University statement), but when, convection, evaporation and the atmospheric window are taken into account, KT have back radiation approximately twice the incoming solar radiation. What I find amazing is that the only thing all of the models prove is that the people who subscribe to them can add up – something I learnt to do in Grade 1. The inescapable conclusion from all of these models is that the “heating power” of the solar radiation is equivalent to the “heating power” of the atmospheric back radiation. And that claim is patently absurd ! I conducted a simple experiment to illustrate just how absurd that claim is. At about 7:am on June 20 I used a small magnifying glass to start a fire on a piece of exposed timber. It took about 2 minutes before it began to smoulder. At that time the incident solar radiation normal to the surface is of the order of ~300 W/sqm. Obviously no method of concentrating atmospheric back radiation can achieve this result. Surely that on its own exposes the absurdity of the whole hypothesis ? Yes exactly. If you can put a magnifying glass under their average power sun and light a fire, why can’t you put a magnifying glass in IR from ice and light a fire? These people represent the absolute worst failure of science. The portion of the article that was of interest to me was the last two paragraphs which claims to explain why there isn’t a perpetual build up of energy/heat with back radiation. There is also a seemingly more complicated visualization provided that looks different than the one I’ve seen you use here. Is this a newer approach by “warming mongers” or just the same old thing? I can’t tell. Hope you can help make sense of this. “Why doesn’t the natural greenhouse effect cause a runaway increase in surface temperature? Remember that the amount of energy a surface radiates always increases faster than its temperature rises—outgoing energy increases with the fourth power of temperature. As solar heating and “back radiation” from the atmosphere raise the surface temperature, the surface simultaneously releases an increasing amount of heat—equivalent to about 117 percent of incoming solar energy. The net upward heat flow, then, is equivalent to 17 percent of incoming sunlight (117 percent up minus 100 percent down). I have a question for Rosco, concerning his last post. The magnifying glass obviously would have no effect on a cloudy day, or at night when dark. From your reply, i get the simple maths of, atmosphere amplifying the sun’s radiation by 100%. So ergo no sun, either cloud or darkness, the magnifying glass should still work if back radiation had any foot in reality, in other words on a cloudy day, it should just take twice as long to smoulder the paper as it is only getting half the imput if the GHGE theory, really existed. I am a layman Rosco that retort may be so simplistic as to be sophistical, but the people i debate are laymen, would you or any of the good folk here frame this simplistic argument/retort better than i have. See Joseph your professor was right, it is to complicated to grasp, simple ways to explain the absurdity are what i need, framed correctly. Appreciate the effort Gary, but I am sorry for the onslaught this is going to cost you. I should have stopped you from doing it. It doesn’t matter what you say or do – no one is interested. People are interested in hearing themselves only, that’s it. Thanks, chin up m8, dont give up on people, keep doing what you do, its only a matter of time, you will still be alive to see ‘climate change’ crash and burn, i wont, keep chipping away at them.